Black and yellow contact lenses covering your whole eyes. 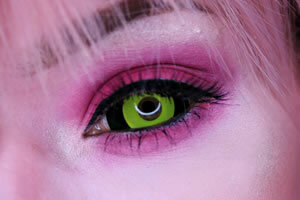 These amazing sclera contact lenses provide a fantastic effect, especially liked by cosplayers and sfx makeup artists, who can transform into a totally different person thanks to them. They give an impression of totally black eyes with a yellow iris, which features in various anime characters, such as Genos from One Punch Man or Mina Ashido from My Hero Academia. Order a pair of ColourVue Sclera Angel Dust contacts and completely alter your appearance!